Dan Callis and Tina Linville, “Ready to See,” 2017, installation view at Jason Vass. The sculptures and paintings of Tina Linville and Dan Callis seamlessly flow together, their art well-matched, forming a dazzling patchwork-quilt of color and texture. Callis creates multi-layered paintings that glow with reflected depth. “I wanted to build up these very dense layers to create intentional space, then subvert it, and build it again,” the artist notes. Delicate, translucent colors harmonize into a poetic prism of light produced by Callis mastery of paint. In “Prophetic Ghosts,” he uses paint and pastels to construct a visually nuanced work with a velvet-like texture. It’s a tactile surface that begs to be touched. Linville combines collaged textile materials with sculptural form. Crammed with found objects, this tactile work takes scraps and bits, and shapes them into abstract creatures whose presence is mysterious and watchful. The artist fuses the collecting and arranging of materials with a sculptor’s eye, yielding densely worked forms. 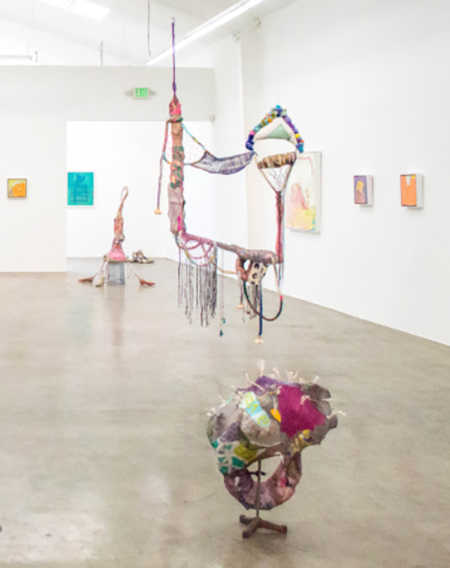 The layered paintings and accumulation of found objects are installed to constantly riff off of one another, forming an encompassing installation that benefits both bodies of work.